Rather confusingly called Zootropolis in some countries and Zootopia in others, this is an incredible animated film and possibly the movie of the year already! Don't be put off by the fact that this is a cartoon, it is not just a children's film, you'll love it whatever age you are. The story subtly deals with issues with stereotypes and prejudice, and really is far better than it probably should be, it that makes sense! Made by the Disney Animation Studio, this is probably the best ever 3D animated movie that Disney has ever made (that doesn't have Pixar involved with). If you liked Disney's other recent cartoon classics - Frozen and Big Hero 6, then Zootopia is simply unmissable. It is classed as a crime comedy film, with a rabbit police officer who is trying to uncover a conspiracy. There are no humans in the movie at all, only walking, talking animals that are all living in one big city called Zootropolis (or Zootopia, if you are in the USA). 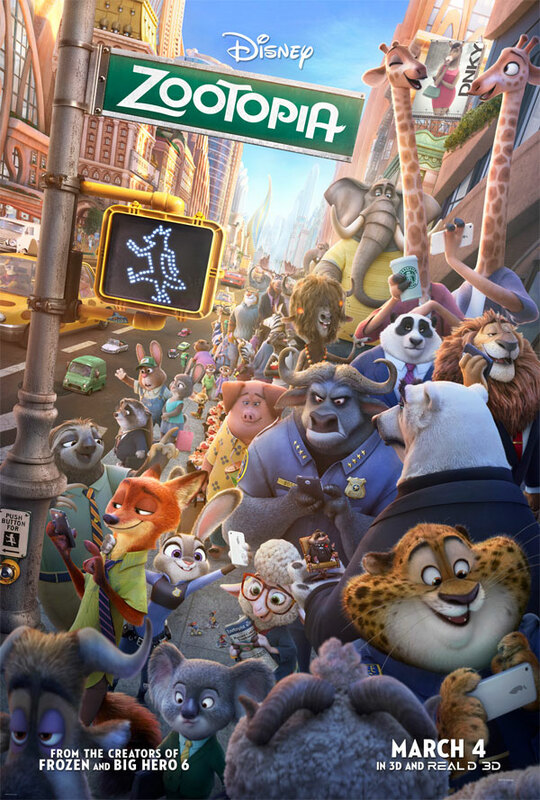 All kinds of animals are in this film, including a rabbit police officer (Officer Judy Hopps, voiced by Ginnifer Goodwin - off of 'Once Upon a Time'), a red fox (Nicholas P. 'Nick' Wilde, voiced by Jason Bateman) and a cape buffalo (Chief Bogo, voiced by Idris Elba). Then there's a slinky river otter (Mrs. Otterton, voiced by Octavia Spencer) and a rather famous pop star gazelle (just called Gazelle, voice by Shakira). Nili Rating: 5 out of 5 - This is a brilliant family film that will most likely run and run, and soon become one of those favourite DVDs that you reach for on a rainy day or at Christmas time. Grown-ups and little children alike will love it, it's hard not to!